We have safely returned home and we would like to thank you once again for the perfect trek you organized for us. 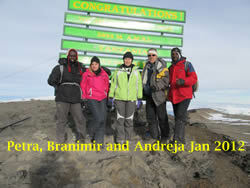 On 11.January 2012, 7:45 we were at the top, climbing through Lemosho route (all three of us: Petra, Branimir and me). Everything was exactly according to the plan. Guides Abel and Noah were excellent: reliable, intelligent and honest. The cook was great: he was cooking vegetarian food for us and also additional meet for Petra. Food was of great quality and we enjoyed it very much. Waiter was very kind and he was always trying that we are comfortable and that we feel good.Porters were also very good: all in all an excellent crew of 10 people only for three of us. During the final climb to the top Abel and Noah helped us to carry our daypacks and all the water for us enabling us to climb the top. We are very grateful to them. The hotel Keys in Moshi was exactly what we needed before and after the trek. The tour around Nairobi was also great.Now after the tour ended we are happy that we chose your agency.It was very difficult to decide for one agency when there are hundreds of them around. We decided for the eight days Lemosho tour, since we wanted longer acclimatization and also it was very convenient to us to have somebody to pick us up at the airport in Nairobi and to organize our transfer to Moshi and back.We would recommend your agency to all friends and colleagues and we are ready to provide the reference about your agency to all the people interested for this trek. We agree that you share information about us with all interested parties.We enclosed a photo from the top. Just an email to let you know how much we enjoyed our trek a few weeks ago and thought Daniel was great. He was so helpful and flexible with our trek and we safely made it up & down! (So were Patrick and our porters!) The food was good it was just too much for us to eat most days. A few photos for you. Please be sure to share especially the one of Daniel with him. Thanks for all your help in the organizing. We will (& already have) recommended your company to others interested. The climb was great! We did really well, no big problems. Reached Stella point at 6:30am on the 23rd, and uhuru peak at 7:30. The whole way was nice, we had really good moments the 4 of us and all the group! Great guides and porters! Great food, we really did have a good time. Tell Castro also that he was quite helpful as well and also Gerard, who helped us in Nairobi. Who knows our paths cross again in the future. Looking forward to it!All the best! Not a problem… all of the guys were good people, so it made it easy. Plus, we’re all brothers and sisters on the mountain. I would definitely like to come back and spend some more time in Africa. It may be a while before I do, but I will definitely keep you guys in mind. Have a safe, prosperous and fun season this year! Hi Chris. I think I can speak for the group when I say that we had a really great experience. I thought our guides and porters were great and we all made it to the summit and back safely. The Keys was nice and my brothers and I enjoyed the safari that we did last Friday with Ernest. For the most part, everything was as promised in your emails and/or on your website. 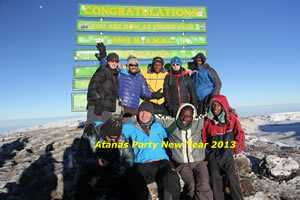 Thanks again and I would definitely recommend your company to anyone asking about trips to Kilimanjaro. The trek was great and everything worked out perfectly. I returned home to Japan, and I am arranging the photograph. 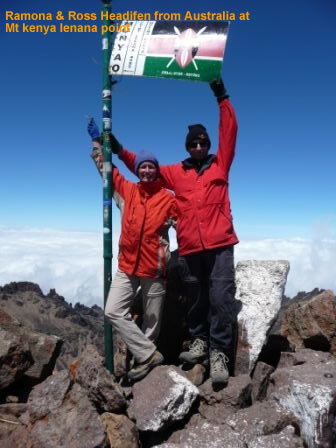 We were able to stand in the top of Kilimanjaro and enjoy our climbing. I and Mr.Amano thanks for your help. I wish to advise to do business with Japanese,if you want. I think that you should pass the schedule table until returning home when the Japanese arrives at Nairobi. In the schedule table, are written the hotel name in which they stays in Moshi and a name of the local agent and the where to make contact, etc. So, we will be able to be relieved. I look forward to the chance to meet you again. arrived home safely and on time. thank you very much for a wonderful and well organized holiday. i would recoomend you to any of my friends who wish to go to kenya. we also might return to east africa. I just wanted to let you know that we were VERY happy with everything. Logistically everything went very smoothly and was extremely convenient on our part. Our guides and porters were fantastic and the service was all around excellent. I will certainly recommend Adventure Kenya Safaris to anyone I know, and will work with you again if I come back in the future. Dear Chris, I am writing this mail to express my gratitude towards you and Mr Castro for organizing such a wonderful Kilimanjaro trip. I am very happy the way everything was planned and executed. Except few issues with the guide and the porter for last 2 days of the climb, rest all went well. Even I had one day safari to Tarangire National Park in TZ organized with Mr Kessy – nephew of Mr Castro.I will surely come to Kenya / TZ again and will do the Serengetti / Masai Mara / Mt Meru etcThank you once again !! Thank you !!! Yes I did summit till UHURU Peak and received the certificate of achievement. My family and friends are proud of me and I am very delighted to see my achievement. Africa is very beautiful, beyond my imaginations and I found many Indians settled in TZ / Kenya and are part of African community. This was my first trip to Africa but I can promise that it will not be the last trip. I will keep coming to Africa and will enjoy the unique experiences. Thank you once again for all you have done for me !!! Hi Chris,thansk alot for asking. I am already back home. Everything was good.I climbed Kilimanajro,although it was quite tough,the serengheti and ngorongoro safari was quite good as well. Thanks again for organizing everything.It is greatly apreciated! We just wanted to email you a couple of photos from the trek that you organised and to say a big Thank You. It proved to be a fantastic experience and all three of us felt it was well organised and planned to perfection. Eric proved an excellent lead with whom we had great confidence. 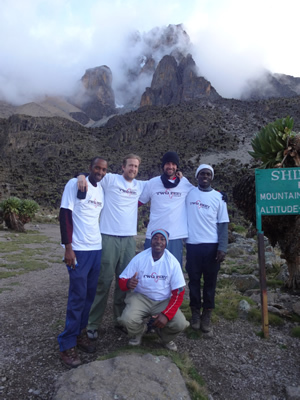 The team of porters were courteous and really helpful and the food was impressive…. I feel so bad for not getting back to you sooner, it was on my to-do list, but I got roped back into work so fast, I didn’t know what happened. I want to thank you for arranging an amazing trip. Me and Adri enjoyed it so much and we have vowed to come back and explore other areas of Kenya and Tanzania, so we will defnitely be in touch. Thanks again for everything and I am glad I met you. Have a great week and we’ll speak again in the future. Firstly, I would like to thank you for everything you have done for us in Africa. I really appreciate your help and wish I can return your hospitality. I will be sending really good reviews and feedback for your company to Trip Adviser editorial office here in London and perhaps Lonely Planet. Initially I was a bit sceptical that things might turn badly into problems but then I realised that we are dealing with honest man with dignity. Thanks again for this brilliant program you have set up for us. Also could you personally thank Eric for those two days we have had at the safari in Maasai Mara Game Reserve.I will be glad if one day I can return the favour. Let me know if you have any intentions visiting London in the near future. We gladly remember you and our visit to Africa! Hi Chris,Just wanted to thank you for the excellent two weeks you arranged for me in East Africa. When I first started thinking about this trip last fall I wanted to find a tour operator who could take me climbing to both Mt. Kenya and Mt. Kilimanjaro. And I needed to find a tour operator who was economical and could work with the time constraints of my schedule. You more than met the challenge! The climbs were well-organized, well-guided and well-supported and I felt like I got great value for the money I spent with you. And you delivered more than you promised, from the airport pick-up at 3:30 AM to the the two climbs themselves to the impromptu tour of Nairobi on my last day to the airport drop-off on my last Saturday evening.So thanks for the experience and I will gladly pass your name on to anyone who needs a tour operator recommendation in East Africa. The trip was great. The guides were really good and the chef cooked us amazing food. So yum. The only criticism I have is that I would have liked a tent to eat in, whilst it was lovely some nights to sit outside, at other times, it was freezing! But apart from that, all the equipment and the people were great and I will recommend your company to my friends. An amazing experience which i will never forget. I have been meaning to let you know what a thoroughly well organised tour ours was. All went smoothly thanks to your preparation and the efforts of Castro and principally Casey in Moshi. On the trek, the preparation and guiding of Mathias and Jackson were professional, exceptional and considerate. 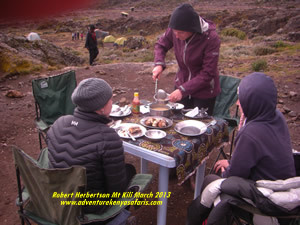 Their experience ensured that we were as well prepared as was possible for the Kilimanjaro climb on Day 5. The efforts of Dismes our cook and Innocent our ‘waiter’ were unexpected and a real pleasure, sustaining us through long, hard days; uplifting us in the evenings. The porter group was hardworking, too, and cheerful. They did a great job. My only other comment is that it would have been better if we had left Machame Gate by mid day at the latest (preferably earlier) so as to arrive at Machame Camp well before nightfall, and possibly before the afternoon rain set in. I had a memorable time in Tanzania thanks to you. I would recommend you, and Mathias and Jackson, to anyone. 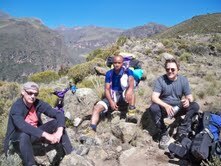 I just wanted to write and tell you how enjoyable climbing Mt Kenya with your company was. Wilson our guide was fantastic and was very helpful in getting us to the summit. Our porter Abu and cook Jesbot were really great as well, in fact, I don’t think I’ve ever been on a trekking trip where the food was as good. It’s always a little unnerving going to a different country for a mountain trek and using a company that you have never used before but from the moment when we were picked up to when we were dropped off, we felt well taken care of by your staff. I’m very impressed with the level of service from Adventure Kenya Safaris. I will be sure to use you guys again when we return to Kenya as well as recommend you guys for anybody looking for a great company to adventure with here. Thanks again! It was a great time and great Experience!! Just wanted to let you know Domenico, Raj and I got back home safely last night. We had an incredible experience in East Africa, and I want to offer a sincere thanks for making that possible for us. I have traveled a lot but you are by far the best that I have worked with, especially because of your flexibility and willingness to make sure things are going smoothly. We will definitely be recommending you to everyone we know who is interested in travelling there. Also want to mention that Ben did an excellent job as well, and we were all very impressed with his knowledge and patience to teach us. Hope all is well for you, and wish you the best. thanks’ for the perfect organization. It was a great adventure. With Wilson as guide and Kim as the mountain guide I had a perfect team.Hope we will see once again.Regards from Germany! Just got wifi today… thank you soo much, it was a great experience, loved it, and have actually already been handing out your info to some other travels. Thanks for making everything right and the changes, it worked out great. I just want to send you a big Thank You for organising the treks in Kenya. We had a lot of fun and joy during our days in the Aberdares and on Mount Kenya. The treks were well planned and perfectly executed. Your guide Eric and his team of porters were a great support, always heplful and courtous, to realise our dream to climb Nelion peak. Not to forget the excellent food we were served on the mountain. 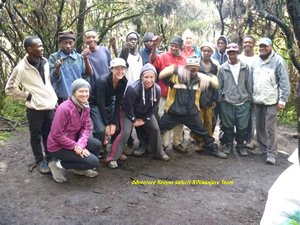 We were well acclimatised and eager to climb mount Kenya after the warm-up trek in der Aberdares (Satima peak). It proved to be a brilliant program, which you set up for us. The days in the Maasai Mara and in Dani Beach were the relaxing finish of our holiday in Kenya. Asante sana for the reliable and worthwhile service. Please pass our compliments to Eric. We would like to point out, that we have been 100% satisfied with your team. The guide Eric was great, the porters friendly and the cook was just excellent. We can highly recommend you and your team and we are looking forward to come back to Kenya. Now that we recovered from the trek, i wanted to thank you guys from my bottom of my heart. First of all to you cris, that helped us booking this trek and taking care of everything, this was extremely helpful for us. Moreover, to Wilson, who was our perfect guide and managed to take us up to the summit with the right phase – that saved us a lot of uncomfortable mountain sickness. And last, the porters and the cook who took care of all of our needs and gave us a wonderful experience with great food and company. We really enjoyed this experience, and we will definitely recommend your company to our friends.